Faleomavaega is Chairman of the Foreign Affairs Subcommittee on Asia, the Pacific, and the Global Environment. He is also a member of the Foreign Affairs Subcommittee on the Western Hemisphere. On the Natural Resources Committee, Faleomavaega serves on the Subcommittee on Insular Affairs, the Subcommittee on Fisheries, Wildlife and Oceans, and the Subcommittee on Energy and Mineral Resources. Congressman Faleomavaega is Vice Chair of the Congressional Asia Pacific American Caucus. He is also Vice Chair of the Army Reserve Component of the National Guard and Reserve Components Caucus. He is a member of the Congressional Human Rights Caucus, the Congressional Caucus on India and Indian-Americans, the Congressional Oceans Caucus, and the Native American Caucus. Rep Faleomavaega was no stranger to Capitol Hill when he was elected to Congress by the people of American Samoa in 1988. He was Staff Counsel to the House Committee on Interior & Insular Affairs from 1975 to 1981. He also served as Administrative Assistant or Chief of Staff for Paramount Chief A.U. Fuimaono who was American Samoa’s first elected Representative to Washington, DC from 1973 to 1975. 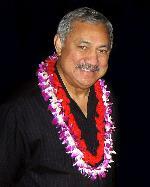 Faleomavaega was Lieutenant Governor for American Samoa from 1985 to 1988. Prior to this, he was Deputy Attorney General for American Samoa from 1981 to 1984. Congressman Faleomavaega served in the U.S. Army and is a Vietnam Veteran. He also served in the Army Reserve where he was a Captain in the U.S. Army Judge Advocate General’s Corps. He was also a proud member of the 100 Battalion 442 Infantry Reserve Unit. Congressman Faleomavaega holds a Master of Law degree from the University of California at Berkeley and a Juris Doctor degree from the University of Houston Law School. He also holds a BA degree in Political Science and History from the Brigham Young University at Provo, Utah and has attended the Brigham Young University at Laie, Hawaii. He is the author of Navigating the Future: A Samoan Perspective in U.S.-Pacific Relations. In his book, Faleomavaega, "outlines ways in which relations between the United States and the Pacific can be improved to mutual advantage and calls for deeper understanding of the exceedingly diverse cultures and socio-political systems of this vast region," says Professor Ron Crocombe of The Institute of Pacific Studies. Congressman Faleomavaega is the only Samoan who was a crew member of the famous Hokule’a during its Voyage of Rediscovery between 1985 to 1987. Sailing from Hawaii to Aotearoa (New Zealand) and back, with stops in Tonga, Samoa, the Cook Islands, Tahiti, and the Tuamotu Islands, the 8-ton, double-hulled canoe retraced the migration routes of the Pacific Islander ancestors – much in the way they did by relying on knowledge of the ocean currents and stars. Congressman Faleomavaega is a Matai or Samoan chief of Tulafale or orator status. He is the only member of Congress with a Tatau, the traditional Samoan full body tattoo that signifies the young man’s passage to adulthood. Congressman Faleomavaega is married to Hinanui Bambridge Cave of Tahiti and they have five children and three grandchildren.